It might be called the “shame game” — a parent embarrassing a child on social media as a way of disciplining them for bad behaviour with the hope they will learn their lesson and mend their ways. But parenting experts say such public humiliation isn’t an effective means of discipline for altering behaviour and can have long-lasting effects on a child’s self-esteem. 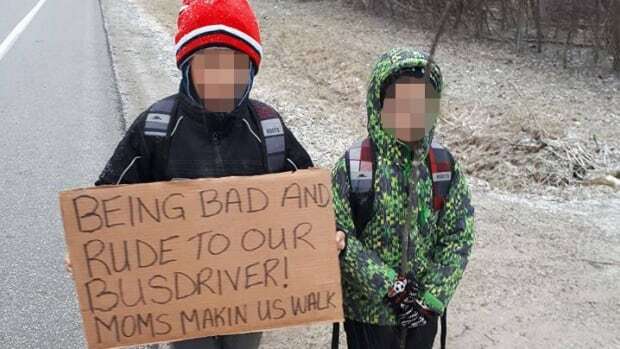 The comments were in response to a recent incident in which a Windsor, Ont.-area mother had her two young sons walk seven kilometres to school, carrying a hand-lettered cardboard sign saying they had been “rude to our bus driver.” Her Facebook posting that included a photo of the boys on their two-hour trek quickly went viral and garnered international media attention. The mother, who is not being named by The Canadian Press to protect the identities of the two boys, said she took the action after receiving a call from her sons’ school about them acting out on the school bus, and that if their behaviour didn’t improve, they would not be allowed back on. In media reports, the woman said she decided to make the kids walk, by her side, to help them understand that riding on the bus is a privilege, not a right — and she never imagined the tactic would generate such attention. It’s not the steps she took to show her sons they should appreciate a bus ride that caused controversy, but the fact that she posted the incident online. Still, she’s hardly alone in her decision to wield social media as a virtual strap. There are reportedly more than 30,000 YouTube videos in which parents use public shaming in a bid to make their kids shape up. For parenting expert Alyson Schafer, such child-shaming deeds are a form of bullying that needs to stop. The Toronto family counsellor said such disciplinary actions reflect misguided thinking on the part of the parents, who believe that if a child is made to feel guilty, they won’t repeat their misdeed. Charles Helwig, a professor of developmental psychology at the University of Toronto, said research has shown that using “psychological control” as a means of trying to improve behaviour is associated with an increased incidence of depression and anxiety in children. But “when you put it on social media, it’s essentially permanent, so it’s something that can come back to haunt the children throughout their lives. Publicizing it in this way is something that can’t be taken back. Children as young as five start caring about their reputations, according to a research review published in March in Trends in Cognitive Sciences journal. In the article, researchers note kids will change their behaviour based on how they believe it will affect their image. Schafer said that if a child feels guilty about something they’ve been admonished about, they don’t differentiate between the behaviour and themselves as a person. As a result, children tend to feel they are unlovable, and that can become integrated into their self-concept, said the author of the book Honey, I Wrecked the Kids. A more constructive way of dealing with a child’s transgressions is for parents to have a discussion about the motivating factors, she said: “What was the child attempting in being rude? Was he trying to impress his friends? Does he need to prove to the world that he needs to be superior to other people? Helwig agreed, saying that educating mom and dad about alternative ways of parenting is healthier for the child and also more effective in the long term.